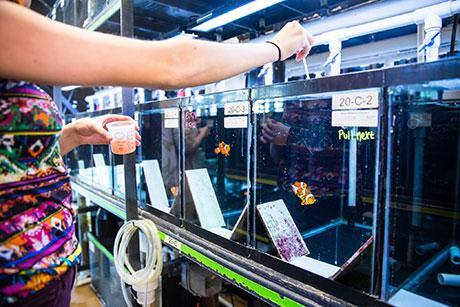 BRISTOL, Rhode Island, May 31, 2018 – When a new test to detect whether tropical fish in the marine aquarium trade had been collected by cyanide fishing – which is highly destructive to reef fish and reef habitats – was reported in 2012, it was hailed by animal rights activists and conservation organizations as a vital tool for policing this critical problem. But after years of diligently replicating the method and being unable to find evidence that the test works, two Roger Williams University professors and two alumni arrived at the conclusion that what had been published were impossible research results. In fact, not only were the RWU researchers unable to validate the method developed by Ricardo Calado and Marcela Vaz, they concluded that it’s not possible to detect thiocyanate (the metabolized byproduct of cyanide) in holding water from exposed fish at the levels claimed by the original researchers. What’s more, they say the thiocyanate levels reported by Calado’s group would have resulted in a cyanide dose that would have been about 10 times greater than the required dose to kill most animals on the planet. Their report, “Can excreted thiocyanate be used to detect cyanide exposure in live reef fish?” – co-authored by biologist Andrew Rhyne, chemist Nancy Breen, and alumni Rebecca Metivier and Julie Lowenstein, with assistance from Lawrence Andrade of Rhode Island-based Dominion Diagnostics – was published yesterday in PLOS ONE, the same peer-reviewed science journal that published Calado and Vaz’s work in 2012. “We provided a mountain of evidence that this method doesn’t work,” said Rhyne, an aquarium trade expert who pioneers tropical-fish aquaculture-breeding programs inside RWU’s wet lab. The Center for Biological Diversity (CBD) and For the Fishes – two nonprofit environmental organizations – published a report claiming that 6 million tropical fish imported into the U.S. each year were collected by cyanide fishing, basing their claim on the refuted methodology of Calado’s group. In 2016, CBD, For the Fishes, the Humane Society of the United States and the Humane Society International co-signed a petition to the U.S. government to cease imports of aquarium fish into the United States unless they tested cyanide-free using the newly reported fish drug test. The test using high-performance liquid chromatography (HPLC), however, had never been validated by the scientific community. At first, the RWU research team approached their project hoping “to validate it so people would start using the test,” Rhyne said. But over a four-year period, sample after sample came up with nothing. The RWU researchers recreated the same conditions and analytical method as Calado and Vaz, tried longer exposure times and different saltwater solutions. They ran control experiments by adding thiocyanate to seawater and were able to verify that the method should work to detect the cyanide byproduct. They eventually decided a more sophisticated testing method using liquid chromatography-mass spectrometry (LC-MS) was necessary that would be able to detect even lower levels of thiocyanate, sending samples to independent testing facility Dominion Diagnostics in North Kingstown, RI. But after evaluating a large number of water samples from fish exposed to cyanide with the new technique, they never found even trace amounts of thiocyanate. The real breakthrough, however, came more organically during Breen’s long, quiet drive to pick up her daughter from Bucknell University in Lewisburg, PA. They had just received the negative results from the diagnostics lab, and Breen said they were feeling frustrated and questioning their work. “I started thinking, what if the fish were hollow, you put them in the cyanide bath and they filled up with the cyanide solution – how much cyanide could they absorb and how much would be excreted as thiocyanate?” she said. Rebecca Metivier ’17 recalled how the team was surprised when each testing round turned up negative results. As a member of the research team for three years, the marine biology and chemistry double-major spent many hours in the wet lab, assisting the professors with exposing the fish to cyanide, caring for the exposed fish and collecting water samples, which she analyzed using Calado and Vaz’s HPLC method in the chemistry lab at RWU. While Rhyne and Breen could have published their paper elsewhere, they felt it was important to give the journal and the authors of the original paper the opportunity to correct the record. Before accepting the new paper for publication, PLOS ONE provided Calado and Vaz a chance to review and refute the RWU’s scientists’ research, but their objections did not hold up against the new evidence. 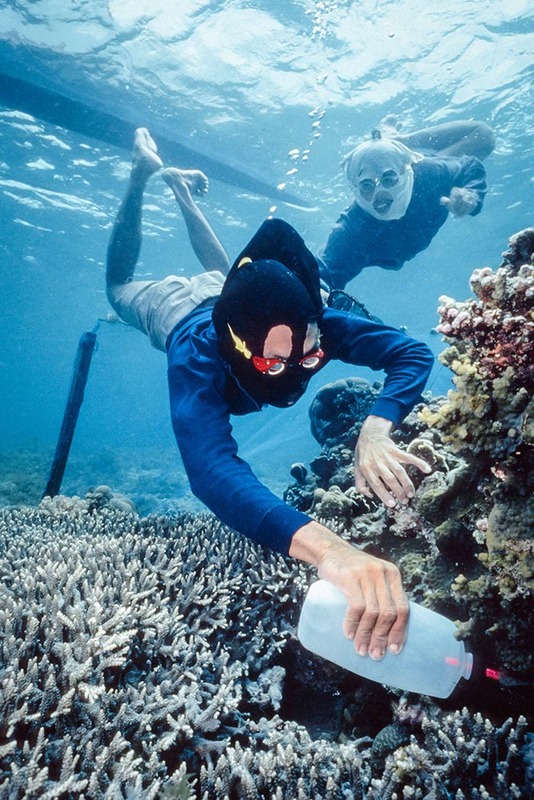 Because cyanide poisoning is so destructive to fish species and the coral habitat, and still believed to be widespread as a capture method in the Philippines and Indonesia, Rhyne and Breen felt it was critical to expose the implausible results in order to move the science toward finding a solution for detecting cyanide poisoning in fish captured for the marine aquarium trade. About RWU: With campuses on the coast of Bristol and in the heart of Providence, RI, Roger Williams University is a forward-thinking private university committed to strengthening society through engaged teaching and learning. At RWU, small classes, direct access to faculty, and guaranteed opportunity for real-world projects ensure that its nearly 4,000 undergraduates – along with hundreds of law students, graduate students, and adult learners – graduate with the ability to think critically, along with the practical skills that today’s employers demand. Roger Williams is leading the way in American higher education, confronting the most pressing issues facing students and families – increasing costs, rising debt, and job readiness.